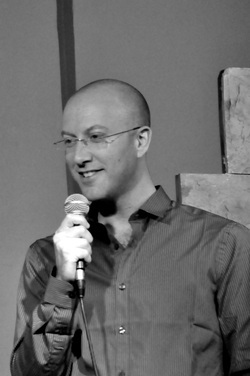 Benji Lovitt has been performing stand-up comedy in Israel and America for years. After spending a life-changing year in Israel on Young Judaea Year Course, Benji Lovitt graduated from the University of Texas at Austin. Five subsequent years in a high-tech career were enough; Benji made the rewarding jump to the Jewish professional world and hasn’t looked back. His experiences working at the Israeli Consulate, Young Judaea, and the Jewish Agency for Israel helped convince him to build a life in Israel where he has been happily living since 2006. Benji copes with the challenges of aliyah through humor and observation and his hilarious blog What War Zone?? ?, videos, and articles have been featured in the Jerusalem Post, the Jewish Daily Forward, and the Atlanta Jewish Times. He has performed in front of groups such as Nefesh B’Nefesh, Hillel, and Jewish Federations and appears at the Off the Wall Comedy Basement regularly.